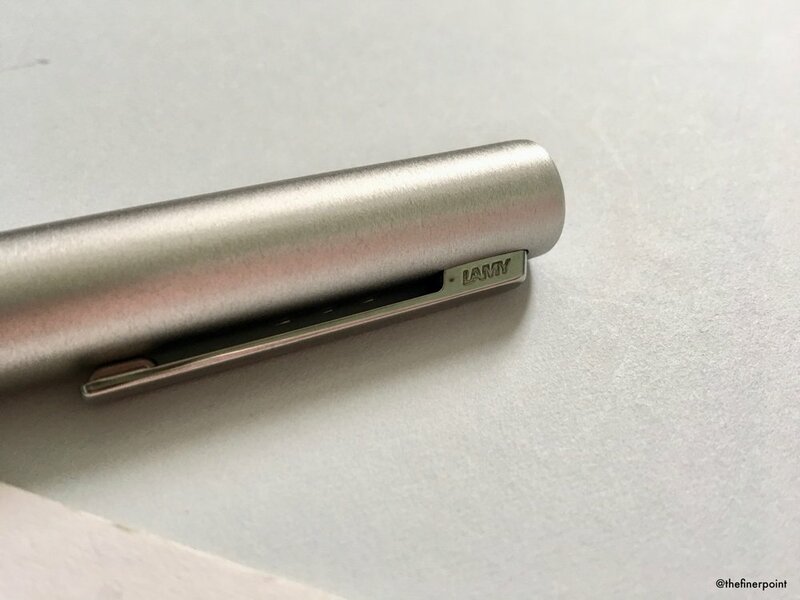 The Lamy Aion was sent to me to review here on the blog by Pen Heaven. All the thoughts on this fountain pen are entirely my own. The Lamy Aion was a welcome addition to the Lamy line of fountain pens and the mid-range fountain pen market as a whole. It’s priced at approx £50 and you get a lot of good pen for the money. The Aion comes in two colour options black and silverolive similar to the colour options from the Lamy 2000 and Lamy Studio range. The design of the Aion positions this fountain pen with Lamys premium products and separates it from the playful entry level pens in Lamys line. I have the silver Aion which almost has a brushed aluminium finish. It gives the pen some grip and texture but also looks really nice. The grip section of the pen is smooth, there isn’t any knurling or the moulded grip you get on the entry level pens. In use its been fine but this smooth grip section isn’t something that’ll work for everyone. The Aion also has its own nib, the Z53 again setting it apart from entry level pens. It’s a firm steel nib that takes my heavy hand well and writes really smoothly. Although it’s new I can’t say I noticed a huge difference from other Lamy nibs. This isn’t necessarily a bad thing as I really enjoy my other Lamy pens. The first thing I was struck by was the size of the Aion. It’s a hefty pen and feels pretty heavy. Most of this weight seems to come from the cap and once you remove that and begin writing the weight and length of the pen give you a nice balance especially if you are using the Aion for long periods of time. Posted the Aion doesn’t look much bigger than Lamys other pens, however take the cap off and you really see how long that barrel is. I have a medium nib which seems to be standard, at least here in the UK. If you want an extra-fine, fine or broad nib these are special order. I have come to really like a medium nib from Lamy because it means I get too appreciate the ink I am using a lot more. The ink flow has been excellent, I haven’t experienced any issues with skipping. Considering this is a different nib to the Lamy Safari/AL Star/LX ranges I didn’t notice too much difference. The progression from these entry fountain pens to the Aion felt seamless. The Aion is a really good fountain pen at a great price point. I had high hopes for this pen and there were a few elements, such as the size which threw me off initially. However after using it for a while and getting used to it, how it felt and how it wrote I am really impressed. More than anything a pen from Lamy at this price point is a very welcome and much needed addition into their range bridging the gap from the Lamy AL Star/Safari to the Lamy 2000. I would like to thank Pen Heaven for sending me the Lamy Aion to review.